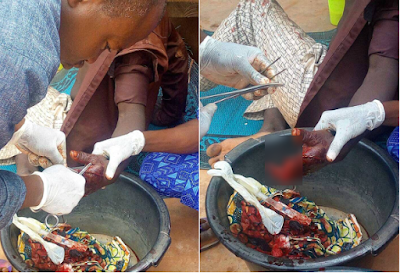 A young man identified as Hassan has lost his fingers after squabble with some Fulani guys on Friday (yesterday) in Matane, Mashegu Local Government of area of Niger State. According to Rariya News platform, a resident, Mr. Nura Alhassan Jigawa revealed that the problem started when the Fulanis came into the town to buy cigarettes and drinks in the community. The victim who was probably in the area told them he doesn’t like the smell of cigarettes as they argued over it. This argument reportedly angered the guys who engaged in a fight with the victim as they used their weapons on him cutting his fingers in the process. The incident almost caused an unrest in the community as youths decided to retaliate the attack by the Fulanis but were persuaded and controlled by security operatives who arrived on time. 0 Response to "Man loses fingers after a cigarette argument with Fulanis in Niger state (Graphic Photos)"